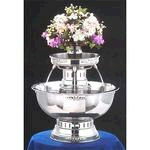 Add a touch of beauty and timeless elegance to your next event with this 5 Gallon Beverage Fountain. The highly polished stainless steel construction resembles fine silverplate, yet will not tarnish or corrode. A classy alternative to punch bowls and ladles! Built with a top floral cup and a bow tie trim design. Use with a maximum of 16 1/2 quarts of liquid. Floral arrangement not included. * Please call us for any questions on our beverage fountain 5 gal rentals in Pipersville PA, Hatfield PA, and Bucks & Montgomery Counties in Pennsylvania.